LOS ANGELES — The same week President Donald Trump put America on a rogue path on climate change policy by withdrawing from the 2015 Paris Accords, California’s political leaders moved aggressively in the opposite direction. State legislators approved more ambitious carbon reduction goals and Gov. Jerry Brown prepared to go overseas to lead America's anti-global warming agenda. Brown leaves Friday for a five-night trip to China, where he will meet with academics and provincial and national office holders. California has already been ahead of most other states in reducing carbon use, and Brown pledged to come home with new agreements that will lead to even lower carbon emissions. Earlier in the week, the California state Senate approved four bills that make clear the state will set its own environmental agenda, regardless of directives from the Trump Administration. One proposal set a particularly aggressive anti-climate-change goal — to wean the state’s electrical grid from all fossil fuels, and carbon emissions, by 2045. Brown predicted in an interview that Trump’s retreat from the landmark Paris agreement would, paradoxically, spur other governments — including other states and foreign nations and provinces — to do more. "President Trump is giving climate denial such a bad name that the opposite, namely climate activism, is receiving a real shot in the arm," Brown said in an interview with NBC’s Sacramento affiliate, KCRA. "We are going to be all the more activated as the president seems to go off into the wilderness of obscurity and junk science." Brown’s second trip to China was planned before Trump said he would announce his decision on the U.S. retreat from the 2015 Paris agreement, which required nations to set their own standards for reducing carbon emissions in order to limit the rise in global temperatures. The U.S. joins Syria and Nicaragua as the only nations who have not joined the Paris agreement. California has long been one of the leading states to respond to the scientific consensus that man-made carbon emissions are dangerously destabilizing to the world’s climate. The state in 2006 passed legislation to reduce emissions to 1990 levels by 2020 and to establish a cap-and-trade program, requiring companies that cannot meet standards to pay for their higher levels of pollution. Last fall, state lawmakers and Gov. Brown made the state's goals even more ambitious – a 40 percent reduction below the 1990 emission level by the year 2030. That benchmark is similar to the one approved by New York, putting two of the most populous states in the vanguard of the carbon-reduction movement in America. 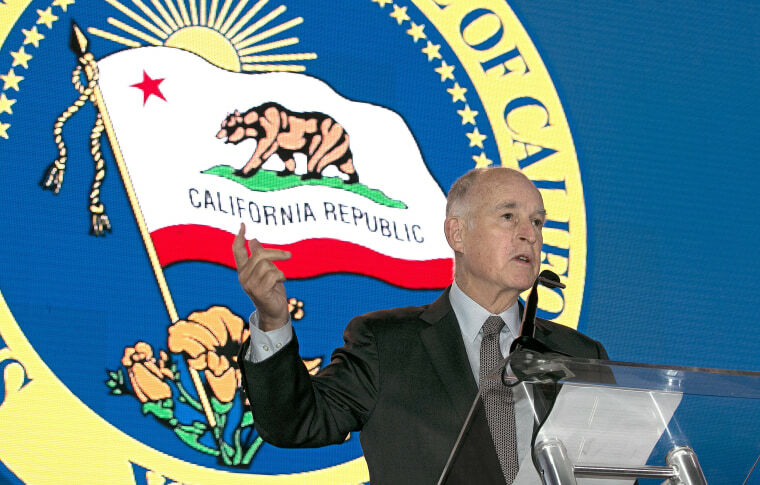 Brown has become one of the most visible of many governors and mayors who believe that local governments can push ahead the clean air provisions that federal governments refuse to approve. After Trump announced his decision on Thursday, Brown, along with Gov. Andrew Cuomo of New York and Gov. Jay Inslee of Washington said they were forming the United States Climate Alliance, which will bring states together to uphold the Paris agreement. The group also has counterparts overseas. California has pushed to expand the Under2 Coalition, a group of 175 nations, states and provinces that has pledged to limit the increase in global average temperature to less than 2 degrees Celsius, the level at which scientists predict potentially catastrophic consequences. The state's aggressiveness on the issue has not gone without opposition. The California Business Roundtable has expressed concerns that California companies will have trouble competing, if they are forced to meet carbon-reduction standards that enterprises in other states do not face. But internationally, California has become an accepted leader. Its cap-and-trade market has been connected to a similar one in Quebec. Mexico is considering joining the pact. And Chinese officials have sought advice from California on how to create their own pollution-reduction market. California’s dissonance with the Trump administration became even more clear in the the package of bills that legislators approved this week. One proposal would keep in place environmental rules that were in place the day Trump took office. Another seeks to protect and maintain government data on climate change, warding off any effort by the federal government to eliminate the information. It also would protect whistle-blowers who speak out against efforts to repress global warming data. Those bills and the ambitious proposal by the president pro tem of the state senate, Kevin de León (D-Los Angeles), to entirely eliminate carbon-fueled electricity in the state now move on to the California Assembly. If approved there, they will move to Brown’s desk. "We are going to be all the more activated as the president seems to go off into the wilderness of obscurity and junk science," California Gov. Jerry Brown. Environmentalists in California have disagreed with Trump's argument that the Paris agreement would kill jobs, instead seeing the movement toward solar, wind and other renewable energy sources as a growth opportunity. They cited improved fuel efficiency standards as an area where U.S. manufacturers should lead. California has set a goal for passenger cars to average about 54 miles per gallon by 2025, up from the current average of 36 miles per gallon. Already a major factor in planning by car makers, the rule looms even larger because it has been adopted by 12 other states. But Trump has ordered a reassessment of national fuel-efficiency rules set under President Barack Obama and suggested he might take away the right of California and other states to set their own tailpipe emission rules. The president says the requirements are too onerous on the car companies and will kill jobs. California leaders argue that consumers worldwide are demanding the more efficient vehicles. A return to dirtier cars will only hurt American car companies as they try to sell vehicles to the rest of the world, the state activists on the issue say. Regulations like those in California and market forces for cleaner fuels are giving the carbon reduction movement a certain momentum that can’t be easily reversed, said Kate Larsen, who helped write climate rules under the Obama administration and now tracks those policies at the Rhodium Group. Still, actions by the states and corporations can’t entirely make up for the U.S. government’s decision to separate itself from most of the world community, said Larsen. And Gov. Brown sounded like he relished the chance to step into the void. “I don’t believe fighting reality is a good strategy, not for America, not for anybody," he said. "So if Trump is going to be AWOL in this profoundly important human endeavor, then California and other states and other provinces throughout the world will step up."